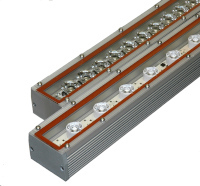 LEDdynamics’ expertise in lamp and fixtures started with the introduction of the first ballast compatible LED replacement T8. This innovation is recognized worldwide and has resulted in the opportunity to help countless companies develop innovative LED lighting solutions. By applying our expertise, LEDdynamics continues to develop and offer standard and specialty low voltage fixture and lamp products that meet or exceed industry standards. * All specifications are subject to change without prior notification.